We recently entered our Carcanet Press Email Preservation Project for one of this year’s Digital Preservation Awards. Each institution was asked to supply up to three images to accompany their entry. We chose to submit one of the beautiful network graphs featured in a previous blog post about the project, and a photograph of the project team (which I won’t inflict on the readers of this blog), but we struggled to come up with a third. Carcanet Press’s email was created using Microsoft Outlook, so a straightforward screenshot of an Outlook inbox seemed to be the obvious choice. However, issues of data protection and privacy prevented us from submitting a shot of a live, current mailbox from one of the Carcanet staff. 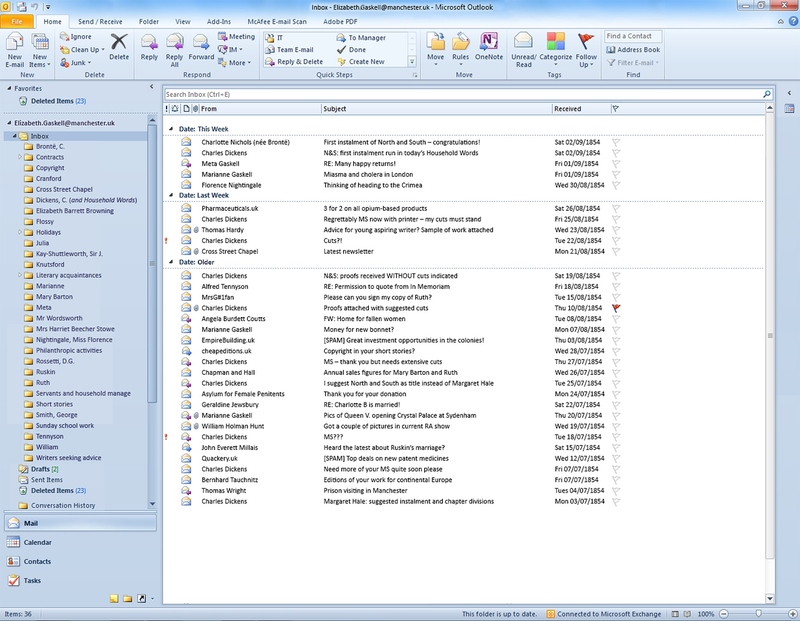 The solution: with kind permission from Microsoft to use a screenshot of Outlook, and the Photoshop skills of Carl Jeffreys from the Library’s Marketing and Communications team, we produced a snapshot of what the writer Elizabeth Gaskell’s inbox might have looked like in September 1854. The archive of Carcanet Press is our most important literary collection dating from the recent and contemporary period, but Gaskell’s is our most significant nineteenth-century literary archive. The editors of her published letters call her ‘one of the great letter-writers of the Victorian period’, and as a prolific correspondent there is no doubt that Gaskell would be fully engaged with email communication were she alive today. In fact, her email account would certainly have looked much busier than the one shown here. Around 1,500 of her letters survive, and this is only a tiny fraction of the total she would have written. She took full advantage of the Victorian postal reforms, which from 1840 guaranteed a very fast nationwide service. It is probably only with the advent of email that our correspondence has begun to far exceed that of Gaskell’s day in quantity and frequency. The editors of her letters also comment on how most of Gaskell’s letters were very hastily written, only a minority being formal, deliberately composed epistles – so her preferred style of correspondence would have been well-suited to the medium of email. She also had few scruples about sharing letters written by other people who interested her, and little respect for privacy; for instance, on one occasion she forwarded a highly personal letter from her friend Charlotte Brontë (in which she announced her engagement) to the biographer and critic John Forster in order to make up for her own ‘dull letter’ which contained little news. The ability to forward emails to one or many correspondents would have been greatly appreciated by Gaskell – although the ease with which this can be done (and the scope for accidentally sending messages to unintended recipients) could well have landed her in hot water. First page of a letter of introduction sent by Gaskell to her friend, the American writer and art historican Charles Eliot Norton. 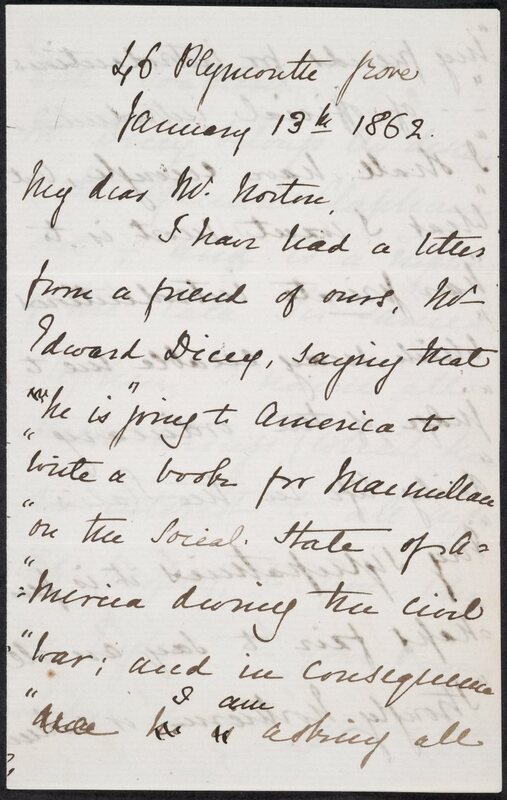 She introduces the journalist Edward Dicey, and quotes extensively from a letter Dicey sent to her. Today she could simply have forwarded Dicey’s email and added her own comments. If email had existed in Gaskell’s day, it is likely that her surviving archive would be much fuller. The way that most email clients retain strings of exchanges – with original messages included in replies – means that we might now have greater access to both sides of her correspondence. Charles Dickens was a key figure in her writing career, and while over 20 of the letters he sent to her survive, frustratingly only three of her replies are extant today. We might also have more of her literary manuscripts: the Rylands holds the holograph manuscript of Wives and Daughters, but this is the only one of her novels for which a manuscript survives. Similarly, we have no proof copies of her work, and it was on the proofs that Dickens tended to make his (sometimes extensive) editorial changes. If manuscripts and proofs had been exchanged as email attachments (and Dickens had made use of the ‘track changes’ facility), those interested in the textual history of Gaskell’s works would have a wealth of additional material to work with. On the other hand, it is hard at this point in time to imagine that an email will ever have the same magical aura of a letter written in the hand of a famous writer. Gaskell herself was an avid autograph collector, and would no doubt have regretted the demise of the hand-inscribed signature, which can be so revealing about a person’s character. Lovely post! Elizabeth Gaskell’s Inbox is genius! Please can we have EG tweeting too! How interesting! 🙂 It would be fun to see ‘inboxes’ of other literary figures…Jane Austen perhaps. Arguably, she might have written a more balanced biography of Charlotte Bronte if email had existed then too!